When do you think about your cooking surface the most? When food is stuck and you can't clean it? When your meal is taking to long to make and people are waiting to eat? When your nonstick surface peels off after a month or two of use? Don't wait until something is wrong to give thought to the surface your food is actually touching. Be proactive and invest in Oster® DuraCeramic™ small kitchen appliances. From skillets and griddles to panini makers and waffle makers, this surface makes Oster® brand small kitchen appliances superior to the competition by making your time in the kitchen easier and more efficient. Check out the top five benefits of this unique cooking surface and why you should get some for your kitchen. With an Oster® DuraCeramic™ cooking surface, you don't have to worry about cooking taking forever. This uniquely designed nonstick surface actually cooks 20 percent faster than other nonstick cooking surfaces. 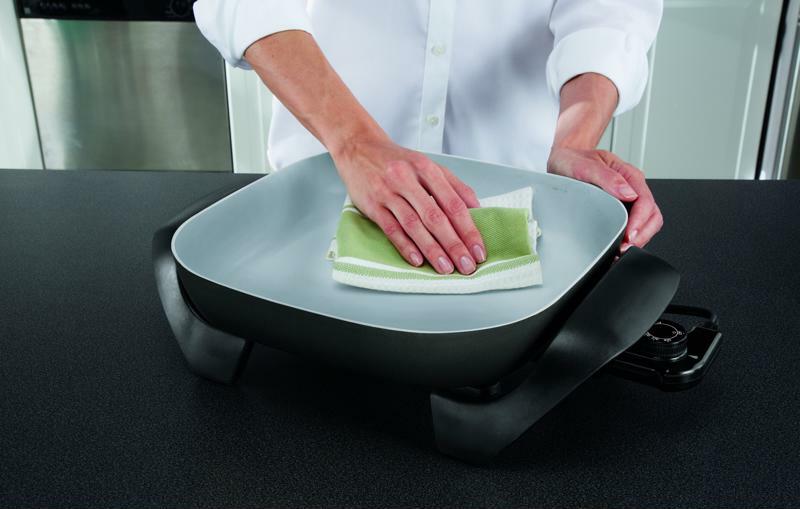 "Oster® DuraCeramic™ cooks food 20% faster than other nonstick surfaces." That means that if you were trying to make a stir fry in your electric Oster® DuraCeramic™ skillet and with a generic nonstick electric skillet at the same time, you could be eating the Oster® DuraCeramic™ skillet-made meal before the noodles from the other skillet were even ready. While having cookware that food doesn't stick to is a great advantage, it's no help if that coating scratches and loses its non-stick after a few uses. That's why Oster® DuraCeramic™ is designed to be scratch resistant. It will hold up to normal use, letting you scoop out or stir food without fear of scratching and losing the non-stick interior. Aside from scratches, the biggest danger of using a nonstick surface is that it may peel up and flake off. Not only does this ruin the cookware, but it can contaminate your food as well. However, Oster® DuraCeramic™, which is free of PFOA and PTFE, isn't going to flake or peel on you ever. It's designed to stay in one piece. Simply wipe Oster® DuraCeramic™ with a damp cloth to clean it. Why invest in an electric skillet, griddle or waffle maker that isn't going to last long? Oster® DuraCeramic™ is made to last as much as four times longer than similar nonstick small kitchen cooking appliances. Maybe the biggest reason people buy nonstick cookware is because you don't have to fight with the messes of traditional pots and pans to clean up. Oster® DuraCeramic™ is simple to clean. All you need to do is wipe down the cooking surface with a wet towel and it'll be ready to use again.